The Eco Coffee Machine Cloth is superabsorbant for spills and residue. Made with nano silver the cloth will stay fresher for longer. The Polishing cloth dries and cleans shiny surfaces streak free. Chemical-free living! Just add water. Save the environment- most chemical cleaners are bad for the environment and your family. Why use them if you do not have to? Save money- stop buying chemical cleaners are use cloths that are expected to last for 500 machine washes. 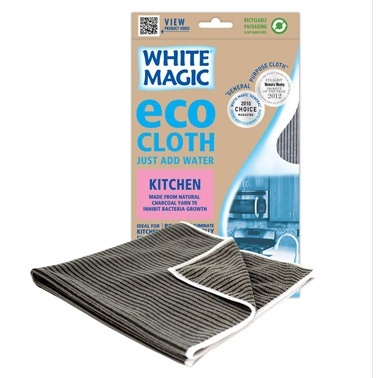 Get a better result- water and the Eco cloth clean effectively without leaving any residue behind. Save time- Simply wet. Wring out excess. Wipe over! Use on espresso machines, filter coffee machines, pod machines and stovetop espresso's.